Seal pots are used for the measurement of high-density and corrosive media. 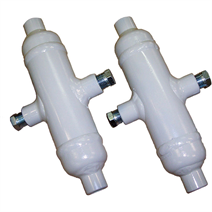 Condensate pots are mainly used for the measurement of steam. Seal and condensate pots are manufactured from seamless pipes with welded and hot-formed caps. RX tests are not required. Seal pots are used in the flow measurement of high-density and corrosive media to protect differential pressure measuring instruments from these media. The seal pots are filled with an unmixable sealing liquid which, due to the difference in density, forms a sealing layer towards the medium. This sealing layer ensures that the measuring line to which the differential measuring instrument is connected is separated from the medium. The sealing liquid serves as a pressure transmission medium. Condensate pots are indispensable for the measurement of steam. They maintain a constant condensate head within the measuring line above the differential pressure transmitter in order to ensure an accurate measurement.